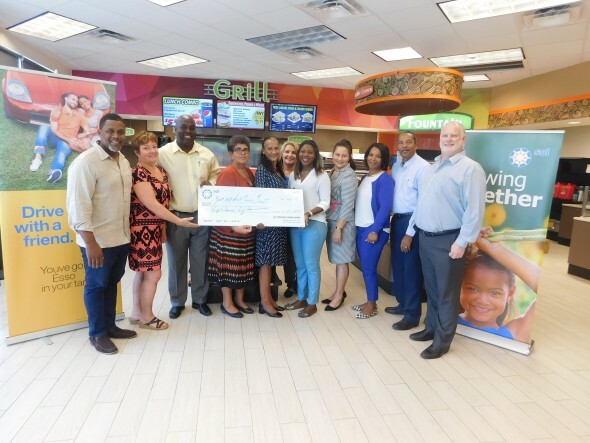 Sol Petroleum Cayman Limited and the Esso Service Stations’ recently presented the Youth Anti-Crime Trust with funding from their HELP CAYMAN promotion. The six-week promotion which was a resounding success recently concluded, on March 30th, during which, Sol and their Esso Service Stations donated five cents (5c) from the sale of each gallon to The Youth Anti-Crime Trust. The Youth Anti-Crime Trust (Youth ACT), a non-profit association was formed at the request of the Government to implement effective prevention and intervention programmes to address the increase in anti-social behaviour and crime from our youth. Youth ACT Chairperson, Bonnie Anglin expressed heartfelt gratitude to Sol, the Esso Service Stations and the community for answering their cry for help and said that the funds donated will be used for Youth Crime Prevention Days within the schools which will expand into the primary Schools. Funding will go towards their Children in Prison and Children with Parents in Prison - (CIP program), and re-start the Community Vocational Training Programme. Sol Petroleum’s General Manager, Alan Neesome commented; “On behalf of Sol and the Esso Service Stations, we are very thankful to the community, for embracing this charity and for supporting this cause as generously as they did. Our investment will go a long way in assisting the Youth ACT in funding their youth support programmes. We are happy to make a positive contribution in the lives of our youth.